DeVon provides the manual for how men can change, both on a personal and a societal level, by providing practical solutions for helping men learn how to resist temptation, how to practice self-control and how to love. He argues the same discipline that drives men in their professional lives needs to be applied to their private lives. DeVon is also transparent about the challenges he faces daily as he endeavors to "Master the Dog" within. DeVon Franklin is an award­winning film & TV producer, bestselling author, renowned preacher and spiritual success coach. DeVon is the ultimate multi-hyphenate. With a commitment to uplifting the masses through entertainment, Franklin has quickly become a force in the media as well as a leading authority on faith, spiritual wellness and personal development. Beliefnet has called him one of the "Most Influential Christians Under 40," Variety Magazine named him one of the "Top 10 Producers to Watch," Ebony Magazine has distinguished him as one of the "Top 100 Influential African-Americans in America," and even Oprah has called him "a bonafide dynamo...a different kind of spiritual teacher for our times." Franklin serves as President/CEO of Franklin Entertainment, a dynamic multimedia entertainment company with a first-look film deal at 20th Century Fox. As a filmmaker, Franklin is producing the inspirational true story Breakthrough starring Chrissy Metz in theaters Easter of 2019. Additionally, he produced the hit animated film The Star and the hit film Miracles from Heaven. 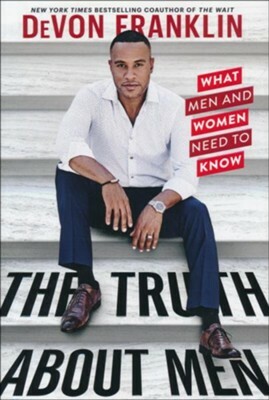 Along with his work as a producer, Franklin is the author of the upcoming book The Truth About Men, to be published in February 2019, as well as The Hollywood Commandments, New York Times bestseller The Wait (co-written with his wife, awardwinning actress Meagan Good) and Produced by Faith. The Truth About Men isn’t just for men. DeVon tells female readers everything they need to know about men. He offers women a real-time understanding of how men’s struggle effects them, insights that can help them navigate their relationships with men and information on how to heal from the damage that some misbehaving men may have inflicted. This book is a raw, informative, and compelling look at an issue that threatens to tear our society apart yet it offers a positive way forward for men and women alike. I'm the author/artist and I want to review Truth About Men.